Although consumers are most familiar with yellow and golden amber, the gem can be white, yellow, and orange to reddish brown. Reddish amber is more valuable than golden amber, which is more valuable than yellow amber. Rarely, strong fluorescence can give amber a bluish or greenish appearance, which when attractive can be highly valuable. Oxidation might cause the material to change color over time. Choosing a color is personal choice although when it comes to Blue amber color grading is very important. Dominican Blue amber comes is numerous shades of blue, the more extreme the blue the higher there price. 100% Clarity is very rare, the larger the specimen the more difficult it is to find. Amber is commonly polished into a free-form shape that follows the original shape of the rough. It might then be set into jewelry or drilled for stringing. Cutting styles for amber include beads, cabochons, and free-form polished pieces. Amber might be faceted, but this is rare. Amber has a lower relative density than salt water so it can feel very light, even in large sizes. This makes it possible to use fairly large sizes in amber jewelry. Treatment by careful heating in rapeseed (canola) oil can clarify cloudy amber somewhat. The resulting amber sometimes exhibits crack-like circular marks called sun spangles. 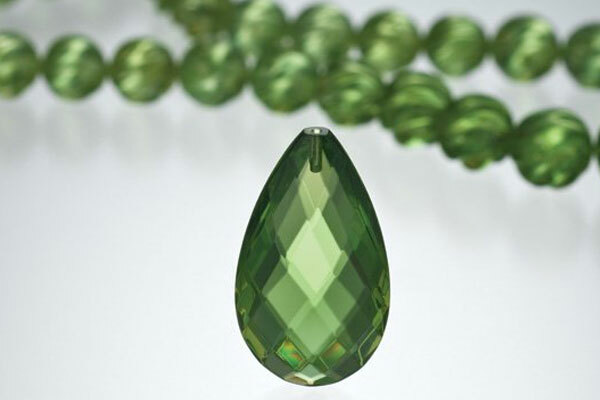 Green amber's color can be produced by treatment with heat and pressure. When looking into purchasing amber do your diligent research. Dominican blue amber has become a hot commodity of late and it fetches a high premium mostly in Asia and eastern Europe. Know what you're buying and once you receive it know how to examine and test the amber. look at where the seller is located. China and India sell the most fake Amber on Ebay and in the big cities around the world I have ever seen and they will advertise it as "Real" "Authentic" "Genuine" "Grade A" "Natural" "Baltic Amber or and Dominican". What they do not say is that the item is an "Authentically Real & Natural Genuine Grade A piece of plastic!!!! For someone who knows what real Amber looks like, a picture is worth a thousand words, but for those who dont, it can and is very deceiving. The most common and easiest way to identify fakes are the ones with bugs and sun spots in them. First, the Amber with bugs. When bugs/insects got caught up in the real Resin/Amber, their legs, antenna, and wings are caught in distressing character. The fake Amber bugs/insects look as if they were paid big bucks for their frozen pose in time, every part of there body is displayed perfectly. The same principle should be taken into concideration with flowers and scorpions. Second, Amber with Sun Spots, also referred to as Sun Burst. Not all Genuine Amber have them, please keep that in mind. In real Amber, these inclusions are very small, too small in size and are irregular. In the fake Amber, this is hard to achieve. The fake Amber will have large disc shapes that are very uniform and perfect looking. Third, This is the biggest worldwide Amber scam and no one talks about it!!!. Pendants, earrings, bracelets and rings that are stated to be red/cherry, blue, green and cognac. This is a more clever technique using real Amber. The real Amber used in this technique is usually lemon/yellow or light honey in colour. What is done to produce the fake red/cherry, blue green and cognac is: the back side of each piece is burned and/or has a jewellers colour paste that reflects through the light coloured Amber to give these colour effects and is used almost in all Amber jewellery that have a silver, gold or some other type setting. There are several ways to identify this. Look at the back of the piece, and you will see it is very different from the front side. You will see if it was burned or has a smooth dark coloured finish and that is what is giving the colour that is not real. The second way is, turn the piece sideways and view the Amber stones from side to side and you will see that the real Amber colour is lemon/yellow or light honey. This technique is widely used to reduce the cost of maufacturing the jewellery an is past on to the consumer as real red/cherry blue green and cognac, at higher prices and making it appear as if you are getting a great deal. Using these genuine colours would be very very expensive. If you already own Amber jewelry or are buying it in person, check using the method I just described and if you are purchasing this kind of jewellery online, on Ebay or any other aution/website, ask if it is "colour enhanced", because that is never stated. These pieces are still gorgeous, but your not getting what is advertised and you are being duped with real Amber with fake colours!!! The majority of this jewellery is manufactured in Poland and other New England states and Thailand. Sorry sellers, someone had to blow lid about this. I will be writing another review, dedicated specifically to this, to help consumers know what they are buying. Amber is one of the few precious substances on earth we consider a gem which is not of mineral origin. There are a couple of scientific theories as to how Amber came to be. I will share the most popular and widely discussed theory here. When a tree is injured or is subjected to a radical climate change, it will produce resin. The radical climate change that took place millions of years ago, during different periods in time, produced large amounts of resin. Amber deposits and its availablity, scarcity and protection will be discussed later and that is some amazing information in itself. Many large Amber deposit are sea born, meaning that rivers and stream carried the Amber to seas and oceans. The most famous and sought after is Baltic Amber from the Baltic Sea and is considered the finest Amber in the world. There are Amber deposits worldwide that run in large veins underground similiar to that of minerals. It is widely known that Amber was produced from conifer trees, mainly the Pinus Succinifera because of its large secretions of resin, conifers are needle bearing trees. However it is known by certain colors that deciduous trees are included such as cherry and plum trees. Deciduous are leaf bearing trees. Sub tropical Amber came from a wide variety of conifer and deciduous trees. These are samples of fake amber sold on eBay On the left, sell as "10mm Natural Dominican Amber" $99 plus shipping from china. The right sells as "14mm AAA Dominican Sky Blue amber beads sphere ball bracelet" $87 from China. To put this in prospective, the going rate of one 10mm bead (apron. .6g) in AAA Dominican Blue Amber sells for $450 per gram purchasing the amber directly from the owners of the mines. Then it gets sold to dealers and eventually the consumer. So getting back to the 10mm bracelet. This bracelet in real Dominican blue Amber will cost the consumer $6500 to $8000 US dollars. These are the facts so don't get fooled. What about Amber with bubbles, said to be “Baltic” Amber.? Baltic Amber is real. It just defines the origin in north east Europe. Has nothing to do with inclusions, shapes, etc. But the problem with Baltic is that most of those are treated, heated and pressed. To get special colors . So not really natural as in only cut and polished. Interesting is the relatively new found Amber from mines in Indonesia. There is even a blue version, only found in Sumatra. These are all natural and make the Dominican and Mexican blues devaluate considerably. Of course there are 4 home tests that will give you absolute certainty; Fresh/salt water, acetone, heating pine smell, rubbing static. Then you know it’s not plastic nor the younger Copal. Certification by Gemological labs is possible btw, we have that done.